Today is Veteran's Day in the United States. It is the day we honor those who have served in the U.S. Armed Forces. In honor of this holiday and all of the U.S. veterans, I wanted to share two of my older reviews that highlight the sacrifices that our veterans made for our freedom. Louis Zamperini was a bit of a troublemaker as a kid, but when he discovered running as a teen, he shaped up and took control of his life. With the help of his devoted brother, Zamperini began setting records and even made it to the Olympics in 1936. Then he went to war. 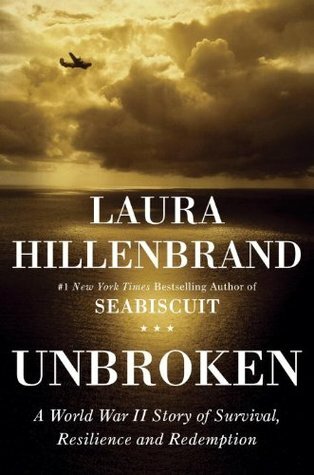 In Unbroken: A World War II Story of Survival, Resilience, and Redemption, Laura Hillenbrand tells the story of Zamperini's life, with particular focus on his time in the war. As a bombardier during World War II, Zamperini fought the Japanese in the Pacific Ocean until his plane went down during a search for a lost aircraft. What follows is an odyssey that takes Zamperini from one horror to another. And in every case, he proves to be a survivor. This is a great idea! I've heard so many good things about Unbroken but unfortunately I haven't read it (so many books, so little time!). Thank you for sharing! It's very good. We read it for book club a while ago and everyone loved it. I can't wait to see the movie. I just recently finished reading Unbroken! So amazing. I have read a lot of books about WWII, but this one really opened up my eyes to a part of the war and what our soldiers experienced that I never really knew before. I felt the same way. I've read so many WWII books but this was a totally different perspective. Great idea for a Veteran's Day post! Unbroken was amazing. Two other incredible books about serving in the military are The Things We Carried and Billy Lynn's Long Halftime Walk. Both are really powerful.